Atlantech Global- an expertise IT outsourcing service to accomplish your project requirement. Distribute the task over a highly efficient team and solve your project in a faster and easier way. Outsourcing is a process to engage a third party organization that exists outside of your company. You can outsource your required service either internationally or locally. This is an easier way to handle the business activities quite skillfully and tactfully. As a very common business practice, it allows the companies of different sizes to grow up as and whenever they require it without getting any major risk or any sort of investment. 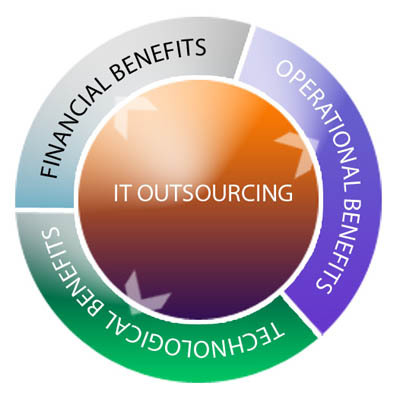 IT outsourcing is a well-known practice of hiring the significant resources from outside of a company to handle some specific information technology-related functions. Most of the companies often outsource the services as it is a cheaper way to contract a third party anytime. There are many IT outsourcing companies in the world who exist to provide the clients proper facilities by solving their vehement requirements regarding the IT related projects. So, hire a reliable IT outsourcing service to fulfill your project goal. Atlantech Global is acknowledged as one of a reliable IT outsourcing company where the team welcomes you to solve your IT related requirements. Whatever the requirement you have you need to speak to us frankly. We make sure you a world-class solution with highly navigable functionalities. Freelancers are dedicated to complete their given task within their timeline. These domestic employees are more committed and professional to their work rather than the official employees. Most of the small companies emphasize the outsourcing process as it is helpful to reduce their cost. Once they hand over their projects to a skillful resource they can remain tension free from project completion. Easy interaction is possible with the outsourcing employees in this modern digital world. It is easy to deal with the outsourcing employees and so, hire a highly professional IT outsourcing company. You can receive your project fully complete that maintains your timeline. If the candidates are capable enough then they will be hired for the next projects. In this way, the relationship continues and more positive feedback increases. Freelancers have lots of opportunities to grow up themselves/their career through outsourcing. IT outsourcing services are comparatively complicated and require proper consultation and interaction with the candidates. In this way, the candidates can prove themselves capable to handle any project and it creates a good relationship between the employees and clients. Here the question arises that why Atlantech Global differs from others. An organization is nothing without a skilled and proactive team. We have selected our candidates so that they can compete with any project related challenge professionally. They can handle your project and strive together to solve the client requirements in a best-proven way. The team believes in "if there is a will then there is a way". Experience the best strategic implementation. Consult with us about your project and get the ultimate resolution. Our entire team deals with the best quality output and ensures you a positive feedback so that you can compete successfully in your industry. Get a partnership with us and experience the best ROI. We promise that we will not let you down. Our team is motivational to bring out the best result. The most effective team with a load of skilled professionals exists in Atlantech Global. As an IT outsourcing company, they are dedicated to meet their deadline anyway. Don't go with our words, follow our client feedback and then hand over your project requirement. Atlantech global consists of a strong team who believe in high-level performance. Client prefers our way of working and as a professional IT outsourcing service provider, we are capable to win their heart. We exist through client appreciation as we follow “the customer is God”. Customer satisfaction is the main criterion to achieve the success in the IT industry. We are identified prominently among our competitors through the key of client satisfaction. Our uniqueness and way of working, project delivery differs our name from others. We are capable to compete in the industry for our dedicated team of professionals and experienced IT outsourcing service providers. They are extremely beneficial for your project solution. It is easy to stay connected with the resources as they are always ready to give the clients’ full project support. Resources can be found in abundance and it means that you can reach them anytime easily through outsourcing. In this digital world, it is possible to stay connected with the outside candidates. They do not require being present in the office. Being invisible in the office, they are considered as the very valuable resources. We focus on outsourcing service as it is cost-efficient and interactive service too. Outsourcing means saving a lot of money. Cost reduction is often due to cheaper infrastructure, labor costs or an excessive tax system in the particular outsourcing location. Business outsourcing is useful for business improvement and most of the organizations nowadays have started to follow it. It is easy to outsource your required candidate from any corner of the world. A reliable outsourcing company offers you fully featured functionalities where outsourced candidates behave like the regular employees. They are as much dedicated to their work as the regular employees. Bring out the potentiality by partnering with a well-appreciated outsourcing service provider like Atlantech Global.